I’m very grateful to Unlearning Economics (UE) for writing in a clear and forceful way a defence of the idea that attacking mainstream economics is a progressive endeavor. Not criticising mainstream economics - I’ve done plenty of that - but attacking its existence. The post gets to the heart of why I think such attacks are far from progressive. It is very similar to debates over whether economics teaching should devote considerable time to the history of economic thought and non-mainstream ideas, and whether economists have much too much power and influence. More critical thinking, real world context and history - yes. This is what the CORE project is all about. But devoting a lot of time to exposing students to contrasting economic frameworks (feminist, Austrian, post-Keynesian) to give them a range of ways to think about the economy, as suggested here, means cutting time spent on learning the essential tools that any economist needs. As Diane Coyle and I argue, economics is a vocational subject, not a liberal arts subject. Let me start at the end of the UE piece. Austerity did not arise because people forgot about its human impact. It arose because politicians, with help from City economists, started scare mongering about the deficit. We had ‘maxed out the nation’s credit card’ and all that. That line won not one but two UK elections. Opponents of austerity talked endlessly about its human impact, and got nowhere. Every UK household knew that your income largely dictates what you can spend, and as long as the analogy between that and austerity remained unchallenged talk about human impact would have little effect. The only way to beat austerity is to question the economics on which it is based. You can start by noting that none of the textbooks used to teach economics all over the world advocate cutting public expenditure in a recession. You can add that governments have not tried to do this since the Great Depression of the 1930. If necessary you can add that the state of the art macro used by central banks also suggests cutting government spending in a deep recession will have harmful effects. You can explain why this happens, and why a Eurozone type crisis can never happen in the UK. That does not dilute the human impact of austerity. What it does is undercut the supposed rationale for austerity on its own terms: mainstream economics. Having mainstream economics, and most mainstream economists, on your side in the debate on austerity is surely a big advantage. Where UE is on stronger ground is where they question the responsibility of economists. Sticking with austerity, he notes that politicians grabbed hold of the Rogoff and Reinhart argument about a 90% threshold for government debt. I want to avoid getting bogged down in the specifics of this example, but instead just talk about generalities. Most economists would be horrified if some professional body started ruling on what the consensus among economists was. I would argue that this instinctive distaste is odd, as UE’s medical analogy illustrates, and also somewhat naive. I would argue that economists’ laissez faire view about defining the consensus (or lack of it) has helped the UK choose Brexit and the US choose Trump. I personally think economists need to think again about this. However to do so would go in completely the opposite direction from what most heterodox economists wish. It would greatly increase the authority of the mainstream, when there was a consensus within that mainstream. It would formalise and make public the idea of a mainstream, and inevitably weaken those outside it. Economics, as someone once said, is a separate and inexact science. That it is a science, with a mainstream that has areas of agreement and areas of disagreement, is its strength. It is what allows economists to claim that some things are knowledge, and should be treated as such. Turn it into separate schools of thought, and it degenerates into sets of separate opinions. There is plenty wrong with mainstream economics, but replacing it with schools of thought is not the progressive endeavor that some believe. It would just give you more idiotic policies like Brexit. It is easy to view the letter from 72 MPs criticising the BBC for being biased against Brexit as just another example of the government putting pressure on the news organisation. But if that is all it was, it is odd to have another conservative MP, Nicky Morgan, describe the letter as chilling. I would argue that this letter as another example of the fear I talked about in this post. Fear by Brexiteers that their little English coup may still unravel. Their reasons for fearing this are real enough. The original Leave vote was based on lies and on obscuring the truth. These lies are perpetuated by those who now feel obliged to advance the Leave cause. I talked in my last post about how Tim Harford had recently noted that tobacco firms had managed to delay by decades the response to the first studies in the early 1950s that smoking was harmful. What chance, then, did economists have before the referendum? But the lies told and truths dismissed in the referendum are going to start to unravel as soon as negotiations begin. One of the main initial topics of those negotiations will be how much the UK will have to pay the EU. Many of those who voted Leave expected it to be the other way around. For this reason, the UK would like everything to be discussed together, so that this bad news can be hidden. But this is not the way the EU likes to do things, and the negotiations are going to be done the way the EU dictates. Remember they hold all the cards, because it is the UK who suffers most with no deal. This bad news could be avoided if the UK walked away, which is one reason why the option of no deal is beginning to sound attractive to the Brexiteers. But the British people do not want this. Here is a recent poll that contrasts the popularity of a EEA/Norway option with no deal. If this is what people feel when confronted with the truth, the only option left to the Brexiteers is to try and hide the truth. Little things are all they ask for from the BBC. Like not mentioning Brexit when talking about rising inflation, because to do so would be ‘controversial’. To play down news of firms planning to leave the UK, because that was the news last week. To not present the view of the EU in negotiations, because this is like a battle and the BBC must be patriotic. The Brexiteers hope that with these ‘small modifications’ to broadcast news, and the pure propaganda from much of the press, they can get away with a deal that is not in the UK’s interests. If those pursuing this agenda do not think the war is over, it would be foolish for those opposed to leaving the EU to believe it ended with the triggering of Article 50. The Brexiteers fear that if there is no deal, MPs in parliament will at last find their voice to say no. Those opposed to leaving the EU must do all they can to encourage that possibility. Among political commentators, all predictions by economists are assumed to have equal weight, so even Janan Ganesh writing in the FT can say “politicians are allowed to question [economists] record of clairvoyance”. That is not true, because economists’ predictions are not all alike, as I have explained many times. One of his favourite politicians, George Osborne, has said that Brexit is the “biggest single act of protectionism in history”. History as well as economics tells us that protectionism of this kind is invariably harmful. A long read on why it is time the rest of the media stopped treating Fox as TV news, and some UK tabloids as newspapers. George Osborne becomes editor of the London Evening Standard. Donald Trump blames GCHC for bugging him because of something he saw on Fox News. The lines between right wing media and right wing politicians seem very blurred nowadays. This should not come as a surprise, because right wing media have been becoming much more like propaganda outlets than normal media organisations for some time. The conventions of journalism may have pretended otherwise, but it time we recognised reality. Let me define two archetypes. The first, which could be called the truth purveyor, is the one we are familiar with, and which much of the mainstream media (MSM) like to imagine they correspond to. The aim is provide the best information to readers or viewers. The second is propaganda. One way of characterising the two archetypes is as follows. Readers have certain interests: objectives, goals, utilities etc. The truth purveyor will provide readers with the information they need to pursue those interests. (As exemplified here, for example.) Propaganda on the other hand, to borrow from Jacob Stanley, aims to provide information that will deceive people from seeing what is in their best interest. Propaganda provides information that supports a particular political goal or point of view. Take, for example, the issue of welfare benefits. Media as the truth-purveyor type will try and present a rounded and accurate picture of those claiming welfare benefits. Right wing propaganda on the other hand will focus on examples of benefit fraud, or cases where the benefit recipient will be perceived by the reader as taking advantage of the system, with little or no attempt to put the example in any kind of context. This slanted coverage is designed to give the impression that benefit recipients are often scroungers and skivers. The political goal is to make it easier for governments to cut welfare payments, which in turn may allows taxes to be cut. These are archetypes, and any media organisation will mix the two to some extent. Many would argue that even the most truth-purveyor type organisation may still embody certain assumptions or points of view that distort their readers view of what should be in their best interest. (As argued in Manufacturing Consent, for example.) Mediamacro is an example of this. But that should not blind us to what is happening elsewhere. Lines like “liberals’ nostalgia for factual politics seems designed to mask their own fraught relationship with the truth”  suggest nothing new is happening, let’s move on. That would be a huge mistake. It is like saying all news is propaganda, who cares. But because there are two archetypes, organisations can gradually move from one to another, and that movement is important. It played a crucial role in the success of Brexit and Trump. In both in the UK and US there is a large part of the media which is becoming more and more like a pure propaganda outlet. We are used to thinking about propaganda as being associated with the state, but there is no reason why that has to be the case. In the UK and US, we now have propaganda machines that support political ideas that are associated with the far right, and political interests associated with the very wealthy. Their output is governed more and more by whether it assists those two goals. Apologists for this right wing propaganda say that most media organisations have their particular political bias, and that will be reflected in the opinions you see in that media outlet. But I’m not talking about opinion pieces or leaders, but about the selection of stories and increasingly about making up stories. I cannot see either the Guardian, Mirror or MSNBC only reporting terrorist incidents by white supremacists, and ignoring those by Muslims. Nor would these organisations make up claims about foreign cities being ‘no go areas’. Suggesting an equivalence between The Mail and The Mirror, or between Fox and MSNBC, is a trap that many fall into. Now it is natural, in a liberal democracy, that the part of the media that conveys propaganda should pretend it is just a purveyor of truth. When its propaganda becomes self-evident, it is also natural for it to claim that this is because it is others who are distorting the facts. In this sense, the fact that Trump and his supporters talk about the dominant liberal media producing fake news, and the right wing tabloids talk about bias at the BBC should not worry us at all. It is merely indicative that those making the allegations are in the business of, or supporting those, supplying propaganda. More importantly, if we allow this attempt at deflection to move us away from examining what different parts of the media are doing, then the propagandists have won. I think it was Charlie Bean who first told me about the stupidity of a firm announcing that it was going to have to make redundancies, without specifying where those redundancies would be. It is foolish because the atmosphere of uncertainty created means that those most able to leave, who are almost certainly the brightest and best and therefore those that the firm would like to keep, end up leaving the firm because they can. Voluntary quits mean the firm no longer needs to create redundancies, but its loses its best quality staff to other firms. I thought about this when reading about yet more examples of how EU citizens are currently being treated by this government. Colin Talbot has documented what is going on here, but there are literally thousands of similar stories. People who have lived and worked in the UK for years are told by the home office, when their application for permanent residence is turned down, to prepare to leave the UK. Applications which ask for a ridiculous amount of information and are turned down for often mindless reasons. It is a system designed to increase the chances that applicants will fail. The effect this has, of course, is that those most able to leave the UK, who will often be the most able in terms of the importance of the work they do, will go. Refusing to confirm the rights of EU residents and sending them scary letters is how the UK government is making the same mistake as the firm that announces future unspecified redundancies. I am sometimes told that Brexit will allow the UK to choose the ‘best immigrants’, the ones that will contribute most to UK output and the public purse. Here we see Brexit achieving exactly the opposite: a system designed to encourage the best to leave. But this is not a new Brexit phenomenon. As I described here, students wanting to come and study in the UK have faced a similar brutal regime, where a mistake by the UK bureaucracy - even when it is acknowledged as such - can lead to additional expense for the student and a period of uncertainty which can only set back their learning. Students midway through their course are told they have 60 days to find an alternative institution to sponsor them or face deportation. The UK Border Agency has no reason to believe that these are not perfectly genuine students who have paid good money to study in the UK, but it chooses to punish them because of alleged failings by a university. There is an obvious pattern here. It is to treat those who are not UK nationals with a complete lack of humanity. It is, quite simply, very cruel. I talked above about how counterproductive it is, but even if it was not it remains very wrong. It is not something that any democratic government should do. Similar things are happening in the US as a result of Trump’s victory. This lack of humanity comes from a government that begins treating foreigners as a problem, as something to be discouraged, rather than as the people that they are. And it persists because a large part of the press deliberately ignores what is going on. That in turn reduces coverage in the broadcast media. Contrast this with Germany, which has admitted around 1 million refugees over the last two years. Whatever the motives of the German government, German society adopted a ‘welcome culture’ to these refugees. There have been problems of course, but it is significant that the most serious you may have read about have been made up by certain US media organisations. Contrast this with the UK government shutting down the ‘Dubs amendment’ programme after only a few hundred refugee children had been admitted to the UK. For Germans it seems that refugees are people who have suffered and need help, but for the British they are something to fear and should be kept away at all costs. Of course not. The above is a quote from Stephen Spender, visiting Germany in 1945, where I have changed German to British. After WWII it was common to believe that what happened in Germany under Hitler could only have happened if there had been some common abnormality in the German character. It was as mistaken then just as it is mistaken now to believe the British are particularly hostile to foreigners. But we should not be surprised when those outside the UK begin to think that way. There is a much simpler explanation in both cases. The state propaganda machine of Nazi Germany was a critical ingredient in their rise to power and maintaining power. Hitler devoted chapters of Mein Kampf to the study and practice of propaganda. It is perhaps the best real world example of the propaganda archetype I described before. In the UK and US it is very different. Critically propaganda outlets do not have a monopoly of information, and they need to appear much like the rest of the media to retain their readers and their influence on the national stage. But a large part of the UK and US media is nevertheless increasingly acting as a propaganda vehicle, particularly in the area of immigration. This change is measurable, as this report of a study shows. 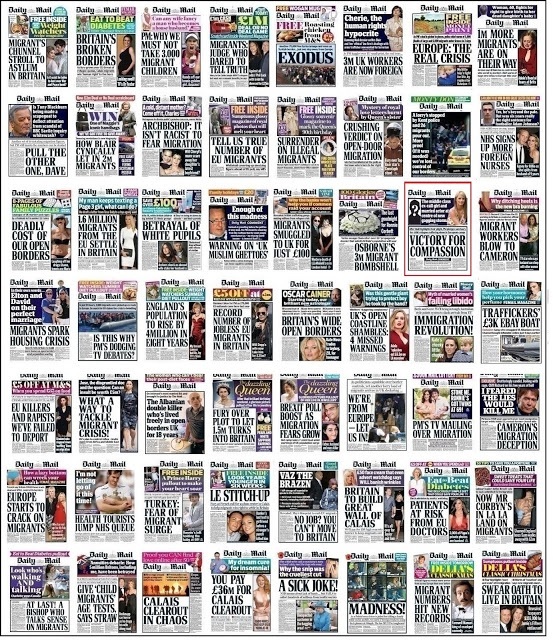 To quote “over the last 10 years [the UK press] appears to have been complicit in the narrowing of a discussion that is now characterised by an increasingly negative tone.” The anti-immigration propaganda in the Mail and Express reached a peak just before the referendum. As Liz Gerard describes here, these two papers printed on average two or three hostile immigration stories in each issue in 2016. The day before polling, the Mail printed six whole pages devoted to immigration. You would have to be a fool to believe these were ‘reflecting the interest of readers’: it was designed to push the referendum vote the way these papers wanted. It was pure propaganda. The are lots of stories around about a post-truth world created by social media. It is usually written up as if it is a new phenomenon created by new technology, but as Timothy Garton Ash notes ‘post-truth’ is nothing new. Equally the hype over Cambridge Analytica (here or here), whether it is accurate or not, is just the technological extension of something that is already happening, and has happened in the past. Most people still rely on the MSM for their news. Post-truth mainly comes from the part of the MSM whose business is propaganda, and the inability of others to treat it as such. Fake news stories on social media did not win the election for Trump. Fox News almost certainly did. As Tim Harford notes, successful attempts to divert those in a democracy from the truth have a long history. Scientists published evidence that smoking caused lung cancer in the early 1950s. It took decades for that information to lead to campaigns to discourage smoking and for smokers to acknowledge there was a problem, and the reason it took decades was that the tobacco companies conducted a PR plan with that aim in mind. Exactly the same happened with climate change, with considerable success in the US as we are now witnessing with Trump’s election. As a tobacco firm wrote “doubt is our product”. As Tim and George Lakoff explain, simply rebutting lies with facts can often be counterproductive. The Leave campaign's £350 million a week was a classic example. The more it was talked about, the more it became fixed in the mind of voters. The regrettable truth is that most people do not read the detail, but instead just absorb the headline. In many ways the EU referendum is a classic example of how facts can lose out to propaganda. All this can just seem depressing, but it is not if we learn some obvious lessons. The first, which Ben Chu explains, is for policy makers not to fall into the trap of appeasement. “Christina Boswell and James Hampshire have highlighted how the public discourse on immigration in Germany was transformed between 2000 and 2008. Social Democratic politicians used familiar arguments about the economic benefits of immigration. But they did this alongside a campaign to promote positive narratives about immigration and its place in the country’s history to counter entrenched perceptions of Germany being kein Einwanderunglsand (“not a country of immigration”). This twin approach largely succeeded in changing attitudes, flowering in the generous position taken by Angela Merkel’s Christian Democrat government towards Syrian refugees in the summer of 2015. But the authors also note that “Our data strongly suggest that most Americans, including those who access news through social networks, continue to pay attention to traditional media, following professional journalistic practices, and cross-reference what they read on partisan sites with what they read on mass media sites.” What this traditional media needs to do, in both the UK and US, is to recognise propaganda for what it is, and treat it with the disdain that it deserves. In the US that is quite a challenge because a lot of that propaganda is now created or recycled by the President himself. In the UK it is a challenge because the right wing tabloids have the government’s support, and the government holds the purse strings of the BBC. It is very easy just to ignore what is happening, and carry on as usual. But this inability or unwillingness to recognise the danger posed by propaganda is part of the reason 2016 happened. Liberal democracy’s survival in the UK and US may depend on recognising and resisting what is in the process of destroying it. Taken from Stahl and Hansen. The implication that they draw, that propaganda as news or post-truth or whatever you want to call it can be combatted by a “democratic revival” seems simply naive. To see the profound difference between, say, the Blair government compared to what came before and after them, you only have to look at how they regarded academics. For those who say how do we know who is telling the truth, then you are part of the problem. And among academics, UK nationals as well. And, it seems, increasingly supplies its journalists. The authors have a post on the Prime website in which they, among other things, respond to two blog posts of mine where I mention their work on Brexit. In the first post they mention , I use a graph from their paper to illustrate how important the Single Market was for UK exports. Here is the graph. By export share, it is obvious that I’m talking about share in destination GDP, as in the chart. In my paragraph there is an error. I used a 6% figure rather than the correct 3.5% figure for their trend in export penetration relative to the non-EU penetration. It was a particularly stupid error, because just below Chart 7 is Chart 8, which contains the correct figure. But, as the authors must know, this error is not important to my argument. Replace 6 by 3.5 in the relevant paragraph and it still makes perfect sense. What I was criticising was the notion that there was any substantial underlying trend in export penetration, and that the impact of EU membership should be judged relative to that trend. You can see from this chart how ludicrous a 3.5% trend is: it implies that without EU membership the UK exports share would be now above 10% and rising fast. This trend seems to be an important part of their judgement that UK export penetration relative to the EU would fall by substantially less than the Treasury assume in their analysis. The trend makes no sense, unless the aim is to make the impact of EU membership look small. So what is the authors’ response to my basic criticism in their Prime piece? There is none. As far a the 6 rather than 3.5 is concerned, it is also odd is that this is the first time they have mentioned the error to me. The post was from mid-January, and I would have happily changed 6 to 3.5 if they had pointed it out to me earlier. The second post was a discussion of the notion of ‘fake economics’. I said fake economics could be described as “economic analysis or research that is obviously flawed but whose purpose is to support a particular policy.” or “We can equally talk about evidence based policy and its fake version, policy based evidence.” Here is what I wrote in full about their study in that post. This is wrong in many ways. First, I was not relying on others, as I had serious misgivings about their use of trends that I outline above. Second, I made no mention of ‘mainstream’ and heterodox anywhere, so any suggestion that this was behind what I wrote is their invention. Finally, there is no problem with anyone challenging anyone else. “The HMT [Treasury] use of gravity model was perfectly in line with best practice. It was classic evidence-based policy analysis”, said Richard Baldwin, Professor of International Economics at The Graduate Institute of Geneva. Professor Baldwin went on to accuse Mr Gudgin himself of engaging in “policy-based evidence making” and “using evidence the way a drunk uses a lamp post – for support, not illumination”. So Richard Baldwin was accusing the authors of exactly the fake economics that I talked about. Given my suspicions about their treatment of trends discussed above, I felt justified in writing about their piece in this context. Recall that the Centre of Economic Performance argued, based on their own extensive analysis, that the Treasury had underestimated the costs of Brexit, so presumably the accusation of ‘very flawed and very partisan’ applies to their analysis too. If one of the authors was happy to argue that the analysis of others had been designed to produce certain results, I felt it only fair to ask the same question of the authors. Actually the second post by date: the two post were a day apart. If the title seems weird, remember that Corbyn only got onto the ballot in 2015 because some MPs felt it would be good for Labour party democracy if the left was represented. The current rule is that 15% of MPs and MEPs have to nominate you if you want to stand as Labour leader. That rule can preclude anyone from the left getting onto the ballot given the current composition of MPs and MEPs. Corbyn’s team want to turn 15% into 5%, but the great majority of MPs will do what they can to stop that happening. It is this that is keeping Corbyn in power. A majority of Labour party members want to be able to vote for someone from the left in any future leadership election. If the 15% stands, that seems almost impossible. These members therefore want him to stay in power for as long as it takes to change the 15% rule. But Labour MPs have no intention of giving way on this, because they believe that if the rule is changed the left will have a stranglehold on the leadership, given the current composition and views of members. That is how Labour MPs are keeping Corbyn in power. Corbyn’s popularity among the membership has changed significantly since the 2016 election. Then he won easily. Since then his popularity has decreased substantially, in part because of his poor handling of Brexit and also because it has become more difficult to claim that his unpopularity in the polls is due to Labour disunity. But MPs will not put up a challenger, because they suspect the challenger will fail. It will fail because by voting for someone who supports the 15% rule members believe they will be voting for their own disenfranchisement. This has become a power struggle between MPs and members, and Corbyn is becoming just a pawn in this game. If that seems fanciful to you, just consider what happened last time round. In an emotional response to the referendum defeat, MPs passed a vote of no confidence in Corbyn. It was a challenge that was far too soon, giving the impression among members that Corbyn was only doing badly because Labour MPs were out to get him. The challenger that MPs chose for the subsequent election contest, Owen Smith, adopted virtually the same policy proposals as Corbyn/McDonnell, but crucially did not back changing the 15% rule. As a result, the members understandably responded by saying if you do not trust us, we do not trust you. Owen Jones has called for a deal whereby Corbyn would step aside in return for someone from the left being on the ballot to replace him, but I cannot see MPs agreeing to that. Their strategy is to exhaust Corbyn and the membership, and preserve the 15% rule at all cost. This is not so much a battle about policies as a battle about power. MPs intend to win it by keeping the 15% rule, and waiting for Corbyn to go through sheer exhaustion, or waiting for members to give up and hand power back to MPs. Labour members hope Corbyn can hang on long enough to change the 15% rule. Events like Brexit, Scottish independence and a general election just pass by, only mattering if they have implications for who achieves final victory in this war. Now many in the political commentariat will assume that of course Labour members cannot be trusted, and so the strategy of Labour MPs is correct. Their pleas for Corbyn to ‘for pity’s sake go’ are just for show. But if that is also your view, consider two points. The first point concerns MPs. The current decline of the Labour party as an effective opposition did not begin with Jeremy Corbyn. It began, as Larry Elliott clearly delineates, with the global financial crisis that happened on Labour’s watch. The unforced errors began when Ed Miliband, and the team around him, made the fatal mistake of not challenging the Tory narrative about the previous Labour government. That mistake meant that Labour was blamed for austerity, Labour were not trusted with the economy, and Miliband’s poll ratings just got steadily worse, even though many voters were experiencing an unprecedented decline in real earnings. It was MPs reaction to the 2015 defeat, and a general belief among many of them that Labour had to move further to the right, which ensured a victory for the left in the subsequent leadership elections. Corbyn and McDonnell tried to create an opposition of all the talents (or at least those that were willing) and reach a consensus on policy. But at each turn they were met by a small group of MPs that constantly briefed against them, and other MPs that did nothing to stop this. Anyone with a clear head could see this strategy by rebel MPs was totally unproductive: Corbyn had to be seen to fail on his own account. The most recent misjudgement by MPs was over Brexit. Again Corbyn gets all the attention, but it was the majority of MPs that decided they should focus on the challenge from UKIP and vote to give May total authority over the negotiations. I think this misjudgement epitomised almost a decade of bad decisions all of which involved an element of appeasement. John Curtice has explained why, with most Labour voters choosing Remain, voting through Article 50 was a very odd decision. As I’ve argued here, the referendum placed no obligation on MPs to vote to allow May to choose a Hard Brexit. If you are unconvinced about this, imagine the referendum had been to do nothing about climate change. Would MPs have been obliged in that case to follow the ‘will of the people’? Would it have been right to ignore a clear consensus among experts that their implementation of the vote would be disastrous? The actual EU referendum has the same ingredients as this imaginary case. The second point is about membership. There is one clear Labour achievement since 2015, a huge increase in membership which numbers more than all the other parties combined. Is it really healthy that this should be regarded by most MPs as a problem? Arguments that half a million people are either Trots or under the influence of Trots are nonsense. Although it was Corbyn who inspired the increase in membership, it was not the left that wrote the rules that allowed the leader to be chosen by the membership alone. Having tried to make the leadership election more democratic, it is not plausible to then turn round and say you got the wrong half million. Elliott describes how many of the policies that Labour currently put forward - Brexit aside - are broadly popular when tested with the public. However if you attach the name Labour to these proposals, their popularity decreases sharply. Those who say Labour have become unpopular because they have ‘moved too far to the left’ misunderstand what is going on, or have more questionable motives. Elliot describes it as Labour becoming a toxic brand. Corbyn is part of that, but only part. The record indicates MPs are also responsible for the current mess. As John Curtice explains, the question is not will the brand survive, but how and when it will recover. I can see two ways forward. The first way is for MPs to trust their membership, change the voting rules, and allow Corbyn to resign sooner rather than later. If he does not resign, the left has to bring forward a challenger. With good judgement, the new leader can lead from the left but with policies that the broad church that is Labour can live with, combined with a strategy for convincing the electorate that would make Owen Jones happy. The second way is that MPs keep the 15% rule, wait for Corbyn and the membership to give up exhausted, and then hope for a Macron type figure to emerge from among their number. The key question is which of those two do you think is more likely to give us a plausible candidate for Prime Minister? The Conservative Party shows that members can learn. They chose Cameron not because they wanted to modernise, or be green, or hug hoodies, but because (after 2 defeats) they realised the party needed to bury the image of the nasty party and they saw in Cameron a person who could achieve that.